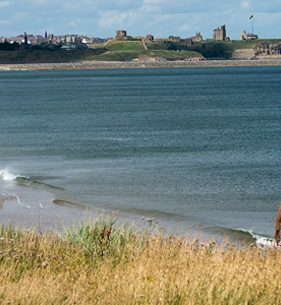 Feel the sand beneath your feet and the refreshing sea breeze in your hair with a visit to Northumberland’s magnificent coastline. Northumberland has more castles than any other county in England. Many of these castles, including Warkworth, Dunstanburgh, Bamburgh and Lindisfarne, stand guard along our dramatic coast. Drive across the causeway to the unique Holy Island of Lindisfarne, the birthplace of the magnificent Lindisfarne Gospels. At the Lindisfane Centre you can turn virtual pages of a facsimile version of the Lindisfarne Gospels. Northumberland’s coast is a giant adventure park where you can enjoy adrenaline-pumping sports like coasteering, kite and wind surfing. Or just relax with a deckchair while the children build sandcastles and go rock pooling. Channel your inner David Attenborough with a visit to one of Northumberland’s amazing coastal nature reserves like the Farne Islands, Coquet Island and Druridge Bay. Inland, head to the medieval market town of Alnwick, with its castle, celebrated garden and vintage shops. A visit to Howick Hall and Garden, the home of Earl Grey tea, is highly recommended for garden and tea lovers alike. Northumberland’s most northern area offers some thrilling history, with the Berwick Walls and ancient battlegrounds. Berwick-upon-Tweed has a rich culture, and inland you’ll find rolling hills and beautiful villages. Tap into a rich seam of history and celebrate Northumberland’s mining heritage at the award-winning Woodhorn Museum.